It was one of the first apartment houses in the city, a Gothic, Victorian, French Renaissance–inspired mix of lovely gables, dormers, railings, and moldings. And if you were lucky enough to be able to afford a flat in the Dakota around 1884, the year the building opened, here’s what the view outside your window would have be like. This 1890 photograph, published in New York: An Illustrated History, looks south from Central Park West and 72nd Street. It’s an amazing contrast: the Dakota, an example of Gilded Age opulence, vs. the shacks and shanties of the surrounding blocks. It wouldn’t look this way for much longer. The Upper West Side was fast transitioning from a collection of villages such as Harsenville and Bloomingdale into a neighborhood of brownstones and apartment houses. This entry was posted on October 22, 2010 at 12:59 am and is filed under Cool building names, Upper West Side/Morningside Hts. You can follow any responses to this entry through the RSS 2.0 feed. You can leave a response, or trackback from your own site. This is one of the most amazing pictures I have ever seen. The contrast of haves and have-nots is mind-blowing. Do you know of an apartment that was retro-fitted in the ’30’s for a pipe organ? My Dad was in the Blessed Sacrament Choir. The choirmaster was Warren Foley. My Dad said he lived in The Dakota and had a pipe organ in the apartment. Any comments??? My father was the Choir Director of Blessed Sacrement and indeed lived in the Dakota before he married my mother in 1951. My father died in 1978, but I heard many stories both from my parents and various people who knew him back in those days. I know he had an organ and a piano, but not sure of the details. Growing up I met a number of former choir boys from Blessed Sacrament who by then had grown up. Perhaps I met your father…what was his name? Sara, I am so excited that you contacted me! My father’s name was Joseph Alfred Carty. He and his brother, Victor Alcide Carty were in the choir in the 30’s. My dad moved to Texas after WW2. When he married my Mom, a Texas girl, I guess he thought they might end up back in NYC, but after one winter, she had had enough! I didn’t know your father or his brother, but I do have some 8×10 pictures of the camp (not sure from which year) of my father surrounded by the choir boys (I remember he was wearing ghilllie shoes!! ), the boys swimming in the lake, sitting around a camp fire, etc. But they are all in cold storage as we’ve moved from a huge loft to a very small apartment. I do remember my brothers and I going with my parents to see where the camp had been. I can’t tell you how much it means to me that I’ve found someone whose father thought enough of those years with the Maestro that he passed on the stories to his children. My dad seemed to affect so many in his choir, much the way he affected me. I was only 25 when he died, but he is always in my heart and in those too short years made an indelible impression on me. I can’t see your email but would be happy to send you my address. Just don’t feel right writing it on here. Hope we can figure something out!!! Thank you for sharing your father’s memories of mine. I’m thrilled and you made my day! I own a pen and ink drawing of the Dakota after its completion. It is perched on the edge of a cliff overlooking these shanties. It was called the Dakota because of its remote location. Apartment living in the countryside? That’s probably the Church of St. Paul the Apostle. The Dakota, one of the first high-rise buildings in New York City, came along with a lot of new development on the Upper West Side. The Dakota was finally constructed on October 27th, 1884. The Upper West Side was a lot of empty land that was just waiting to be bought and built on. once the Dakota and buildings like the San Remo were built next to Central Park and in a new area, it was no longer just the East Side of the City that housed the rich. The San Remo began to be build in 1929, it was deterred by the depression, but was later finished in the early 1930’s. The whole Upper West Side was developed by architects who were looking to make the next great building, considering it was not only such open land, but it was also home to many rich. Along with developments on Central Park, next came Columbus, which was considered the Avenue of Commerce. Amsterdam was the next Avenue over, and it was consumed by low rent housing and small shops and stores. Many poor Jewish men and woman struggled to make money as merchants all the way north and south of Amsterdam. What is now West End Avenue was the main avenue of residence. It not only started to be filled up high-rise buildings, but also with lower based houses, like brownstones. It was mainly consumed by the rich. Like West End Avenue, Riverside Drive also gave way to the new housing developments for the rich, mainly Jewish people. The rich jews’ dominated this area because the luxurious housing on the East Side would not allow Jewish residence. Also jews’ could be closer to their own religion if they lived in apartment buildings with mostly other jews’, rather than east where there were very few apartment buildings yet developed. Riverside was and still is based right along the park, so it became even more prominent property towards the end of the 19th century. 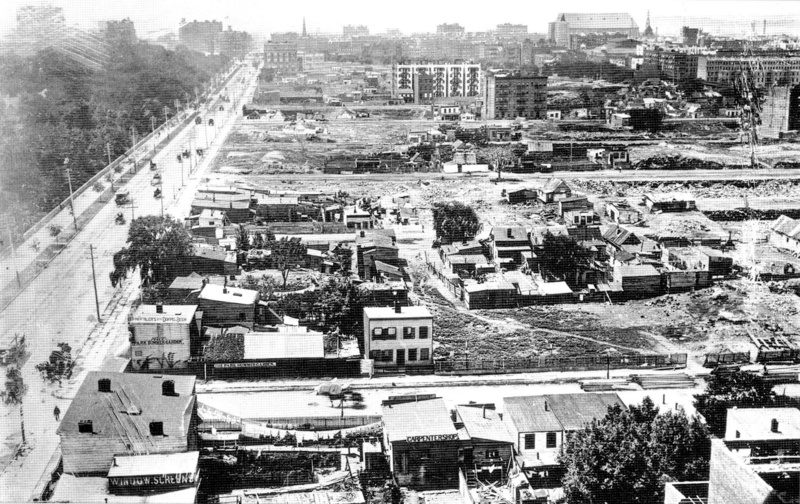 The low-rise homes that had lined the Upper West Side for about 50 years started to be destroyed and gave way to the newly developed apartment housing which really formed the Upper West Side. The look has not disappeared. The mix of apartments and low-rises for middle-class to upper-class citizens still remains to present day. Even the layout of Avenues and their different characteristics are as prominent now as they were then. Now the dominating apartment complex’s of the Upper West Side. Frederick Bourne owned the entire first floor and had an Aeolian Organ in the apartment as well as an enormous one at his Long Island home, Indian Neck Hall…Oakdale. Bourne was president of the Singer Sewing Corp. early 20th c.
I just came across this same photo in “Life at the Dakota” by Stephen Birmingham. The caption in this book says that the photo was taken from the roof of the Dakota in 1887. If you want a deeper dive into the Dakota, I recommend this book. There’s also a great drawing of the Dakota with shanties and goats right in its backyard.